Wow !! Four months since my last post. Not that I have not thought about writing or been sewing... just was not in composing mode I guess. I have been stitching and am currently working on rows featured in Row By Row Experience 2015. The theme for 2015 is water and there are such creative designs showing up in fabric stores in Canada and the United States. The patterns are free and fabric kits and license plates may be available for sale. Each store has an individual design personal to them. My first row was from Atlantic Fabrics in New Glasgow. I'm loving the water theme. A kit and a fabric license plate arrived from Quilting B & More in Charlottetown PEI after a trip across the Northumberland Strait thanks to a kind brother. This design so mirrows the island look. There is no set layout for the rows and I am too impatient to wait until I get more so I am just going to sash them and see what happens. 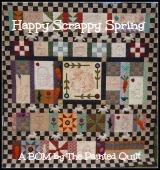 Merrily, Merrily, Merrily, Merrily quilting is a dream !